Nye Bevan, the inspirational founder of the NHS, believed that improved and sustained mental health was key for the nation to thrive. 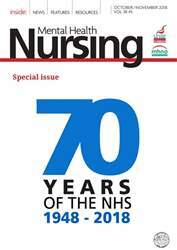 I have had a long association and appreciation of the NHS for most of its 70 years. I was born at home in Liverpool in 1962 with the help of a midwife and our family’s GP. And now, more than half a century later, I work at a university business school with NHS staff on leadership programmes and also introduce business undergraduates to healthcare systems including the NHS. When I left university with a history degree I was determined to become a public servant and got myself a NHS admin job. From 1985 to 1992 I was initially a NHS planner and then almost overnight in 1990 I became a NHS commissioner as purchasers and providers were created across the UK. It was during the late 1980s and early 1990s that I had most to do with mental health in my career. I played a very small role in the closure and reprovision of mental health and mental handicap services (as they were then called) into the community.